The ladies of 2NE1 who have been busy promoting their latest mini album, Ugly held an autograph session at Times Square in Yeoungdeungpo-gu, Seoul. CL (이채린) wore a Burberry Prorsum leather jacket from Spring/Summer 2011 with a black top and Balmain leather pants from Spring/Summer 2011. Chrome Hearts sunglasses, belt and Gianmarco Lorenzi Suede Ankle Boots in grey to complete her look. 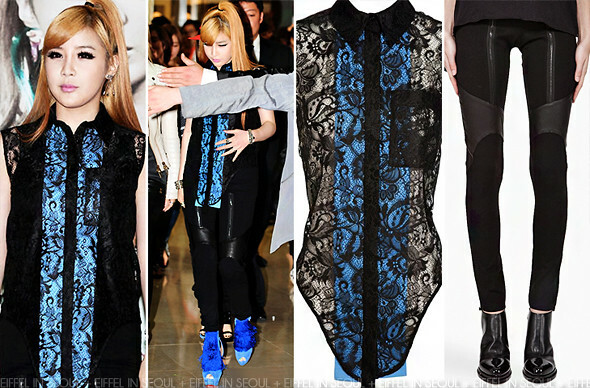 Park Bom (박봄) woreBalenciga Lace Shirt with Silk-Cotton Panel from Spring/Summer 2011. While she may be my best dressed at the event, I didn't like her Givenchy Stretch Leggings too much. Matching blue suede Christian Louboutin Change of the Guard to complete her look. Those sky-scrapers were also worn by several stars like the Amanda Bynes, Jamie Chung, Jessi J, Kardashians, Kylie Minogue, Nicki Minaj. 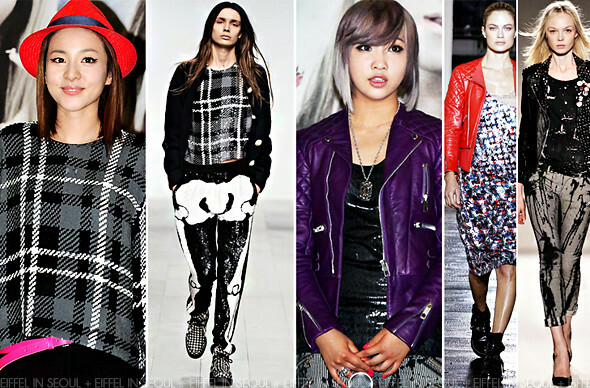 Sandara Park (박산다라) wore a sequin plaid top from Ashish Fall/Winter 2011 collection. Accessorizing her outfit with a red fedora hat, neon pink belt and Alexander Wang Liu heels in black (not photographed above). Gong Minzy (공민지) matched her ash purple hair with a leather jacket from Balenciaga Spring/Summer 2011. Black sequin top, Balmain Black and White Striped Stained Jeans and Azzedine Alaïa boots to complete her look (not photographed above). Love her neon pink nails. something's off with CL's outfit combination, must be the accessories ruining it..
i like the hair, i think the outfit would look even better without the sunglasses and necklace. She's still my best dressed though.